According to a recent market research report published by Transparency Market Research, the global food certification market is estimated to expand at a CAGR of 5.30% during the period between 2015 and 2021. The report, titled “Food Certification Market - Global Industry Analysis, Size, Share, Growth, Trends, and Forecast 2015 - 2021”, forecasts the global food certification market to be worth US$16.0 bn by 2021. The overall market was valued at US$11.2 bn in 2014. Food certification can be implemented at any stage of the food supply chain, right from primary production to sales. Rising incidences of food borne illnesses due to the consumption of contaminated food products have led to the demand for certified food products. Growing consumer awareness has impelled food manufacturers to obtain certification from regulatory bodies. As certified food products undergo a number of verification processes, they are perceived to be safe for consumption by customers. This has boosted the demand from the global food certification market. According to certification types, the report segments the global food certification market into Safe Quality Food (SQF), International Food Standard (IFS), International Organization for Standardization (ISO 22000), British Retail Consortium (BRC) standard, Halal certification, Kosher certification, the U.S. Department of Agriculture (USDA), the U.S. Food and Drug Administration (FDA), China Food and Drug Administration (CFDA), Food Safety and Standards Authority of India (FSSAI), European Food Safety Authority (EFSA), Ministry of Food and Drug Safety (MFDS), and others. These certification bodies are region-specific and they ensure the safety of food products through audit and follow-up. On the basis of application, the report categorizes the global food certification market into dairy products, organic food, processed meat and poultry products, infant food products, beverages, and other packaged food. Growing awareness about food safety has led consumers to prefer certified food products. The demand for certified organic food products is expected to increase considerably during the forecast period. 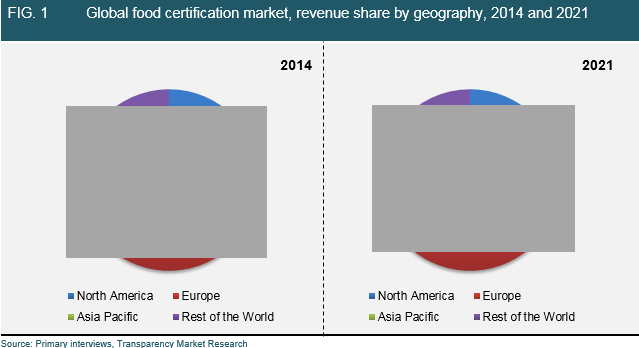 The report studies the global food certification market across four key regions: Asia Pacific, Europe, North America, and Rest of the World. In North America, the U.S. dominates the global food certification market due to growing health consciousness, coupled with rising consumer awareness regarding side effects of adulterated food products. Germany and the U.K. are the leading food certification markets in Europe. In Asia Pacific, China and India have emerged as strong markets for food certification owing to the growing preference for superior-quality food products. The report profiles some of the key players in the global food certification market such as Intertek Group plc, AsureQuality Limited, Dekra SE, Bureau Veritas, Underwriters Laboratories Inc., SGS SA, Lloyd’s Register Group Ltd., DNV GL Group As, and ALS Limited. The report offers insightful information about the key players including their financial overview, recent developments, and business strategies.